Happy Friday! I hope you have had an awesome week! I had the chance to meet up with Carolyn from Life with Miss Myrtle and Samantha from Life and Messy Hair yesterday for brunch at the Green Bean in Greensboro. It's so much fun connecting and meeting up with other bloggers who understand why you're taking a picture of your coffee or shoes. They just get it. Haha! 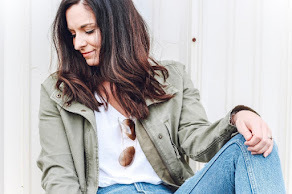 Today, I am sharing eight items that I am currently loving that you can wear now during the winter by layering up and you can wear them in the springtime! Who says you can't throw a little bit of color into your winter wardrobe?! With the lack of sunshine that often occurs during the cold months, I need all of the color and brightness I can get it. 1. Sunglasses | I am loving the style of these sunglasses! They are so classic yet still fun. I love sunglasses in general because they are such a necessity for my sensitive eyes. 2. Pendant Necklace | How pretty is the color of this pendant?! I love how unique the color is and it reminds me of my November birthstone. 3. Off The Shoulder Top | I actually don't really own any off the shoulder tops. I have one but it has straps so it's technically not completely off the shoulder. I love the style of this one and it comes in four colors, including a gorgeous black floral pattern. This top is definitely on my wish list! 4. Blush Chambray | Y'all, this is a blush pink chambray shirt! All of the comfort of your traditional chambray but the color is perfection. I need this in my closet! 5. Hunter Boots | I own these boots and I love them so much! They are the perfect shade of pink and add such a fun pop of color to boring winter outfits. 6. Plaid Peplum | Yes, another peplum top this week but this one is plaid and I don't own any plaid peplum tops. This one would be great with a cardigan now and with sandals in the spring! 7. Lace Up Flats | Aren't these flats just the cutest?! I am loving the scallop detail and the color will match any outfit. 8. Tote Bag | More blush pink because it's just so pretty! I love this affordable tote bag! I love all your choices here. Pink is my favorite color right now! So ready for Spring time! I'm loving all of your picks, especially those pink rain boots - SO CUTE! Love all of these picks! Makes me so excited for Spring to come! You're making me dream of spring already :) love these tones, little shades of pink are my absolute favorites. I literally just whipped out my card and bought this off the shoulder top!! Why do you want me to be poor? lol - JOKES!! Thank you for sharing this amazing top!!! I am SO excited to rock this blush pink for Valentines Day!! Your style is my inspiration!! Thank you for sharing this post Emily!! Only bloggers will ever understand lol!I love all your picks! I ant pink hunter boots soo bad! !